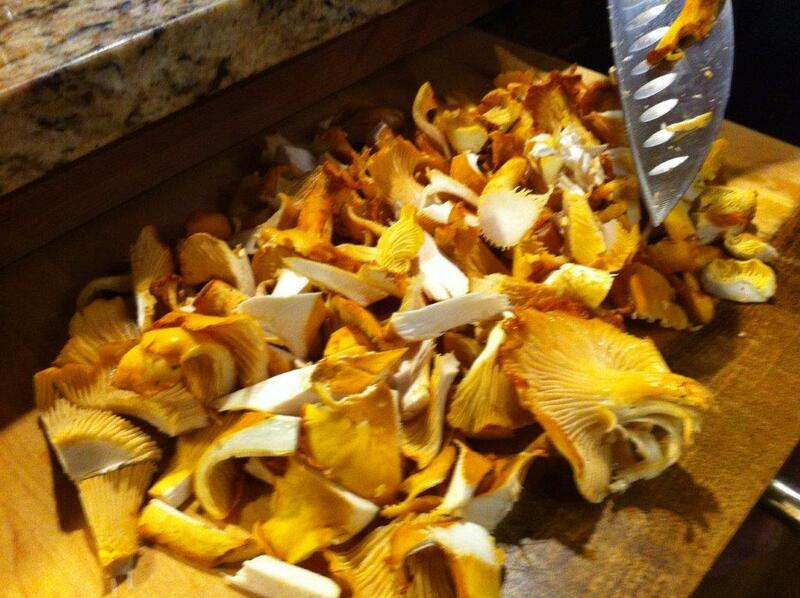 This week’s recipe for French Fridays with Dorie is actually for chanterelles with napa and nuts. Until last September, I’d never eaten chanterelle mushrooms. When I went to Seattle for IFBC last year, I visited with an old friend the day before the conference started. For dinner, her husband treated us to risotto made with chanterelles that he had foraged himself! I also sampled chanterelles during a couple of restaurant meals I had in Seattle that week. That was mid-September, so in the last week of August, I suspect the season is not quite upon us yet, which is why I had trouble finding them. I had some sourcing challenges with the mushrooms. I went to 4 different stores, and the best I could come up with was a package of “gourmet medley mushrooms”, which consisted of sliced shiitake, oyster, and cremini mushrooms. Also, I had half of a pedestrian green cabbage in the crisper drawer waiting to be used up, so I used it instead of buying a giant head of Napa cabbage. The recipe only uses a third of a cup, and this avoided also having to figure out how to use up the rest of that cabbage too. 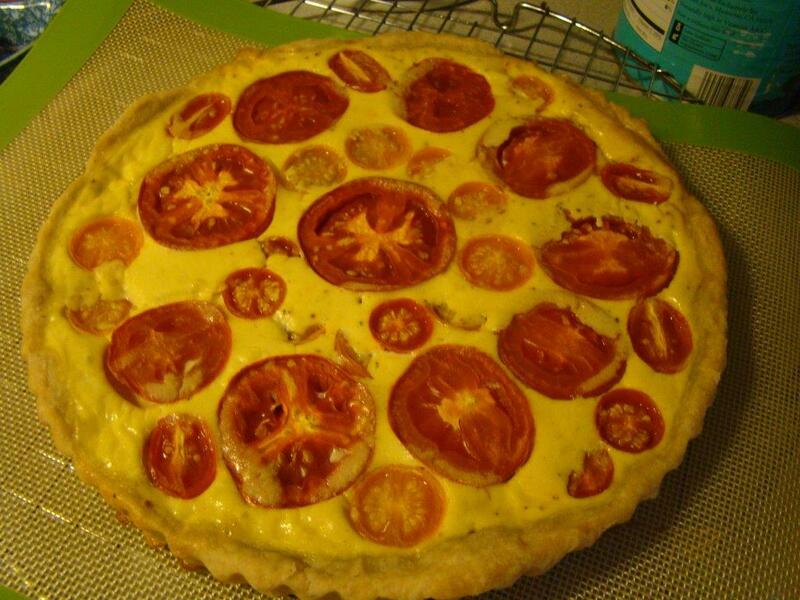 The recipe was meant as an appetizer, but I served it as a side along with the caramelized carrots I made for the Cottage Cooking Club and Gerard’s mustard tart made with tomatoes. 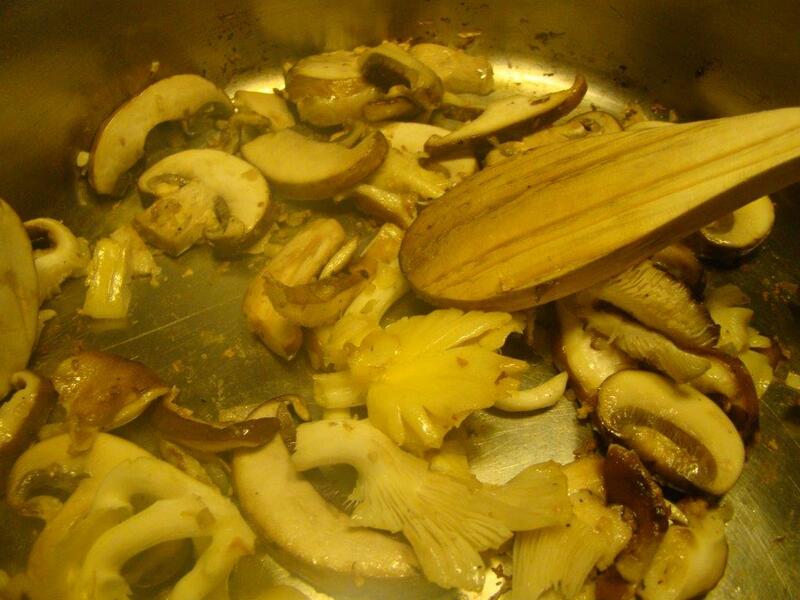 The mushrooms were a hit at my house, and I will definitely make them again, whether I ever find chanterelles or not. For my U.S. and Canadian friends, I hope you have an excellent long weekend! See you next week. Some of my cyber-friends participate in The Cottage Cooking Club, organized by my friend Andrea, the Kitchen Lioness. I’ve followed their cooking adventures for the past few months and have been tempted to join the party. This group is cooking vegetables in simple and delicious ways, as envisioned by Hugh Fearnley-Whittingstall in River Cottage Veg. Andrea has kindly allowed me to participate as a guest this month, and try the group on for size. I selected two recipes from Andrea’s August lineup: Quick couscous salad with peppers and feta (page 231) and Caramelized carrots with gremolata (page 355). In my typical fashion, I waited until the last minute to complete my challenge. When I picked the couscous, I didn’t realize that I would be making another couscous recipe last week. 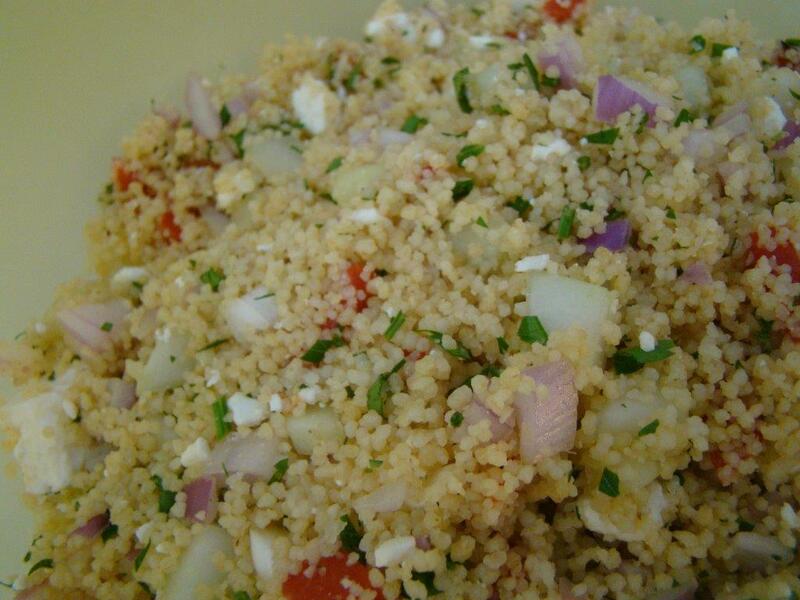 That’s a lot of couscous in the same week… This recipe (quick couscous salad) aptly named. It was very easy to make. The couscous takes just 5 minutes to cook. Then, you drizzle the hot couscous with lemon juice and olive oil. While it cools down, you chop roasted red pepper, a cucumber, and some red onion, mince some parsley, and crumble some feta. All the ingredients get tossed together, and you have the perfect salad for lunch! It was like sort of like a simplified Greek salad with couscous instead of lettuce. I enjoyed this couscous and look forward to trying the tomato-olive variation while I still have overflowing bowls of cherry tomatoes on my counter. The carrots were completely different than the couscous. 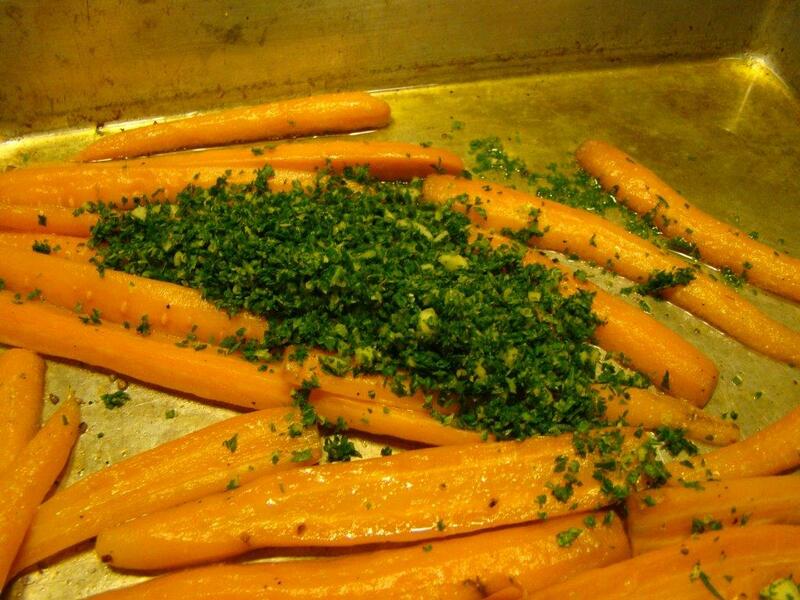 Young carrots (from my farm share) are roasted in butter and oil until they are tender and caramelized. 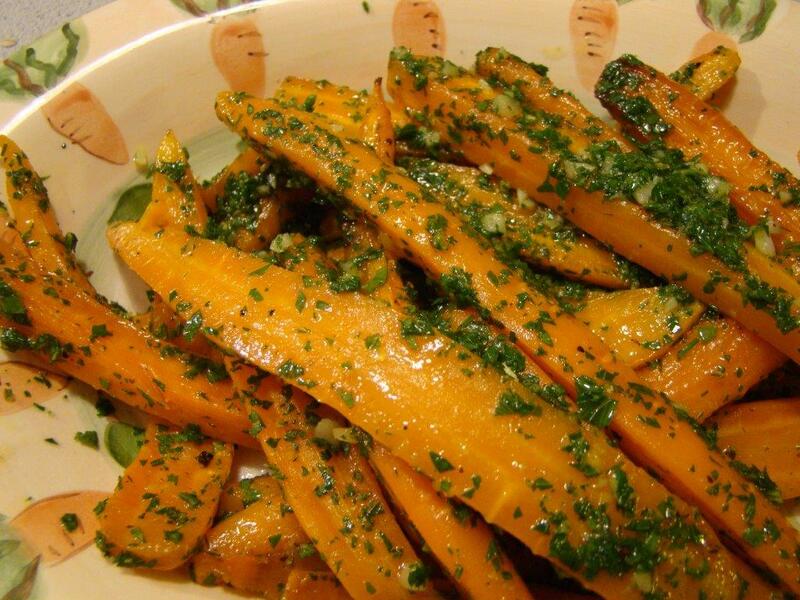 The hot carrots are tossed with gremolata made from lemon zest, garlic, and a generous amount of parsley. I can’t believe that’s all there is to it. The presentation was gorgeous, so colorful! And, I had an excuse to pull out my carrot serving dish. I think this will make more appearances on my table, especially in the colder months. The carrots might not be as fresh in the winter, but the overall flavors will bring a needed ray of sunshine. To see what other participants made this month, check out their links here. And, thanks, Andrea, for letting me cook along this month!